Banyan teammates gathered for a photo before enjoying a luncheon event to celebrate AMT Day. Banyan celebrated its 8th annual AMT Day on Friday, May 24, 2013. This annual event pays tribute to Charles E. Taylor, the first Aircraft Maintenance Technician (AMT), who built Orville and Wilbur Wright’s engine. It is also a day that Banyan uses to honor its Aircraft Maintenance Technicians, Avionics Team and Parts team for their dedication to quality and safety. Banyan’s Director of Maintenance, Dave Valenta organized the lunch-time event and recognized the group as “unsung heroes whose dedication enables aircraft and passengers to fly safely.” Albert Beltran, Banyan’s corporate Chaplain, said a prayer, followed by Lou Homsher, Banyan’s Chief Inspector – Turbine Maintenance, who introduced Pete Snead, senior FAA Inspector. 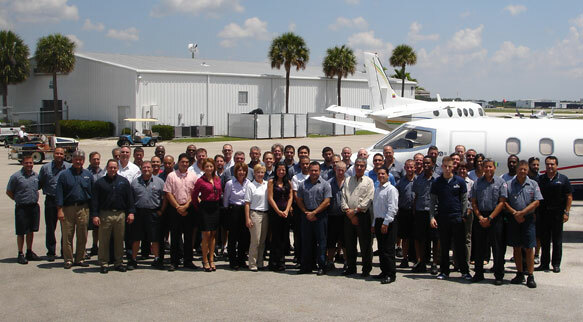 Banyan Air Service based at Fort Lauderdale Executive Airport (FXE) is recognized as a top FBO in the United States by aviation professionals. Banyan’s maintenance department offer comprehensive aircraft maintenance services, including heavy airframe and engine maintenance, structural repairs and modifications, interior refurbishment, exterior painting and aircraft parts sales and service. Banyan avionics offers comprehensive avionics installations, repairs, modifications, and is an authorized dealer for all major avionics manufacturers. In addition to High Speed Data solutions, they have extensive installation experience with In-Flight Entertainment upgrades, glass cockpits, LPV/WAAS upgrades, Flight Management Systems, Satellite TV, Enhanced Ground Proximity Warning Systems, Multifunction Displays, Satellite Communications, and Traffic Collision Avoidance Systems. Banyan is certified as both an FAA and EASA repair station and has also earned repair station designations for Argentina, Brazil and Venezuela. Banyan also offers a mobile avionics team to provide services on location. For more information, visit banyanair.com.